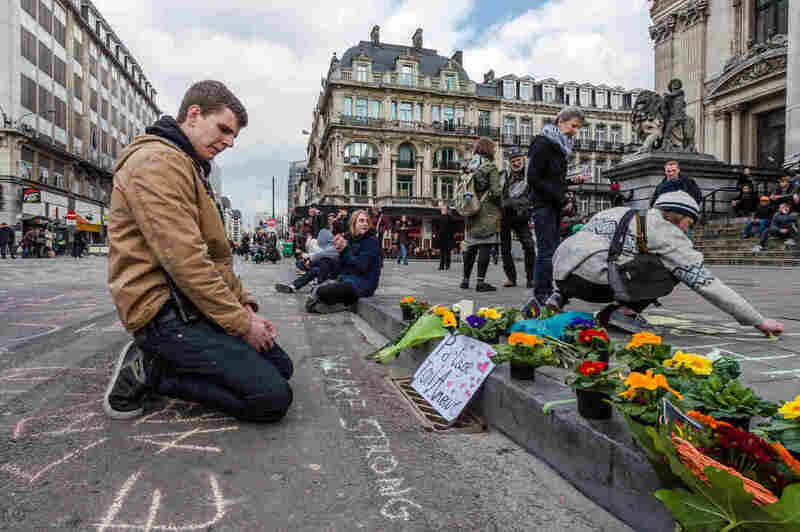 Worldwide Outpouring Of Grief After Brussels Attacks : The Two-Way Here's a look at how people are expressing solidarity for Brussels, where attacks killed at least 30 people today and wounded hundreds of others. A man looks at flowers and messages of support outside the stock exchange in Brussels on Tuesday following the deadly attacks. After Tuesday's deadly attacks in Brussels killed more than two dozen people, we're seeing an outpouring of grief and support from around the world. Like we saw after the November attacks in Paris, many took to social media to express their condolences and solidarity with the people affected — and latched onto prominent symbols associated with the country. After the violence in Paris, renditions of the Eiffel Tower and the French flag were widely shared. Now people on social media are posting images of the beloved cartoon character Tintin mourning the attacks to show their support for Brussels. The world-traveling reporter drawn by cartoonist Georges Remi is one of Belgium's best-known exports. As Time magazine reports, Tintin, his dog Snowy and other characters from the series "have long been national symbols of Belgium." Another emerging symbol of solidarity is the image of the Manneken Pis, a bronze sculpture in Brussels showing a boy urinating. As The Independent reports, "It is an emblem of the rebellious spirit of Brussels, according to the city, and it is being shared by people as a symbol of defiance." Reaction has been particularly strong from France, where attackers killed 130 people in a string of deadly attacks in Paris last November. The city of Paris said in a post on Twitter that it plans to light up the Eiffel Tower with Belgium's colors this evening. Ce soir, @LaTourEiffel sera illuminée aux couleurs de la Belgique. One cartoon by Algerian cartoonist Ali Dilem, titled, "Terrorism strikes again," shows a badly battered man with a sign that reads, "I am Brussels." The man faces a group of people who are all carrying signs with the names of other cities hit by major attacks, and says, "Can you make me a little place?" Another widely circulated image reads, "Thoughts for Brussels and all of Belgium." You can find a recap of reaction from U.S. officials and presidential candidates from our friends at NPR Politics.